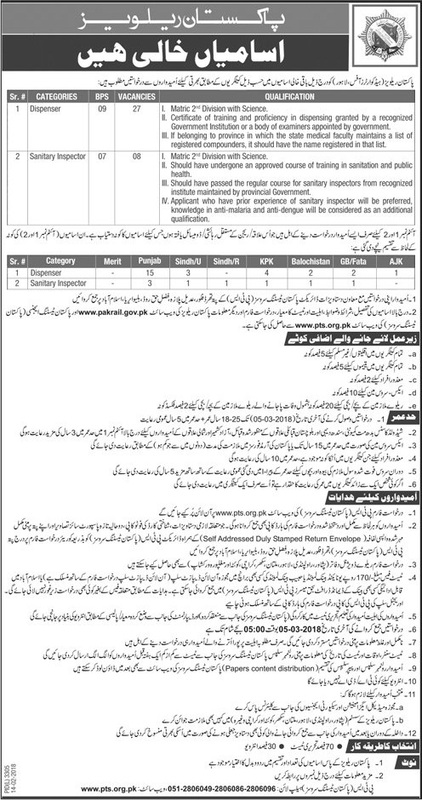 Government of Pakistan has announced 35 New Government jobs in Pakistan Railway 2018 in Daily Jang Newspaper 14th February 2018. Candidates who meet the required Criteria may apply for these Latest Government Jobs 2018 against the titles given as follows, Dispenser (BPS-09) 27 Posts and Sanitary Inspector (BPS-07) 08 Posts. Candidates can register online by filling online application form on Pakistan Testing Service (PTS) Website, candidates have to submit hard copy as well.